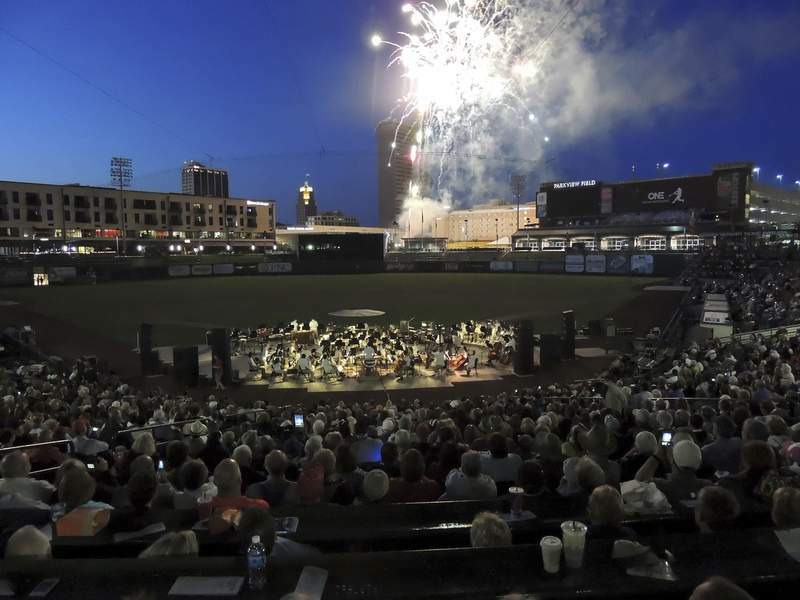 Courtesy The Fort Wayne Philharmonic is going outdoors to perform its free Patriotic Pops concert for the second time at Parkview Field. Before assistant conductor Chia-Hsuan Lin can explain how she feels about the Fort Wayne Philharmonic’s Patriotic Pops concert, she needs to talk baseball. Specifically, about a friend’s father who was a baseball coach. She remembers in elementary school how her class was invited to the baseball park and how excited she was to run around the bases on the field. It’s the same sort of excitement that overcame her watching the TinCaps play at Parkview Field recently. As she took in the game and the players on the field, it felt a little unbelievable that she would be performing at home plate for today’s concert. "It gives you a such a feeling," she says. "It was at that moment, I realized that, ‘Oh my God, I’m going to be there. It’s going to be so fun.’ "
Lin will conduct today’s Philharmonic Patriotic Pops concert at Parkview Field for the first time. The orchestra’s move to the open-air baseball park last year, coupled with free admission, proved to be successful with more than 6,200 patrons attending the concert. Lin says infusing the energy of "America’s Pastime" into a orchestral performance makes it a more accessible experience. "It’s a great fit. It’s an open space with people cheering and rooting for their team and that energy in baseball fields always fascinates me," she says. "At a concert for the Embassy Theatre, for example, you want to respect others and be quiet and enjoy the music, but since we’re in a space that’s outside (at Parkview Field), you don’t have to worry about interrupting people. You can walk around, stretch and enjoy the beautiful weather and the great music." The concert will have a lineup of familiar tunes including, "Yankee Doodle Dandy," "American Salute" and "Battle Hymn of the Republic." Pyotr Tchaikovsky’s "1812 Overture" and John Philip Sousa’s "Washington Post March" and "Stars and Stripes Forever" will accompany the fireworks. The orchestra also will honor the military with the "Armed Forces Salute," in which veterans will be able to stand when their service branch theme is played. "We’re all familiar with the strong rhythm and the majestic quality of this music, but I particularly like that there are often warm and touching stories that are tied to the music," Lin says. "For example, the ‘American Salute’ is based on ‘When Johnny Comes Marching Home,’ and that longing and that hope for loved ones to return is so intimate." Joining the orchestra in November, Lin was able to finish the remainder of the orchestra’s 2014-15 season, which she says gave her a chance to interact with both musicians and the crowd before diving into her first full season this fall. "Musically, it has been such a fruitful season for me. I have had musical theater collaborations, I got to work with Broadway vocalists, I got to work with Fort Wayne Ballet, and we closed the Pops season with ‘Pixar in Concert,’ which was really cool. All of those collaborations were awesome, and I really enjoy working with the Phil musicians. Every time I work with them, I gain perspective when I’m on the podium," she says. "(As for the audience) I’d give them two thumbs up – if I had more, I would give them five." For Lin, she says the Patriotic Pops concert draws in listeners who may not see the orchestra at the Embassy or other venues, and even if they only join the musicians for this one evening, she’s hopeful of what the orchestra will share. "Just come to relax and enjoy," she says. "It’s a great time to unite every one together. We’re all here to share this particular moment together with the people we care about. That’s the most important thing."